Apparently Jordan Spieth isn’t the only one who kept the momentum rolling after the explosive Masters Tournament. 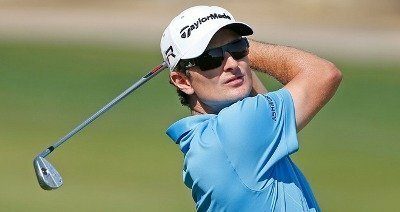 Justin Rose has yet to come down off his high from Augusta, as he posted rounds of 69-66-65-66 to claim the victory at the Zurich Classic after a weather-delay riddled weekend. As he celebrated his birdie putt on #18 he looked up to the sponsor’s tent and flexed his bicep to show off the Zurich embroidered logo on his left sleeve. If that doesn’t win you some serious sponsor brownie points then I don’t know what will. The victory also lands him a nice paycheck of $1.2 million to take back home to Florida, propels him to 15th in the FedEx Cup points standings and moves him into the top-10 in the OWGR rankings. Rose didn’t start off the season on much of a high note – making only 3 of 6 cuts and finishing with just one top-10 – but has turned it around in the month of April. That could prove to be just the confidence boost he needs heading into The Players Championship in a couple of weeks. While The Players Championship isn’t technically regarded as one of the four majors of the season, it is without a doubt one of the highest payouts Tour players will see all year at a cool $10 million. That puts the event up there with the PGA Championship and The Masters, in terms of total purse money. Rose had his best ever showing in The Players in 2014 with a T-4 finish and his lead-up to that event was remarkably similar to how he’s progressing this year. No doubt he’ll be a favorite going into the event but we’ll get the opportunity to see if he can keep the momentum on his side this week in the WGC-Cadillac Match Play event. Really glad to see him get a win. He is one of my favorites and by all accounts a really good guy. Nice article. Rose is that type of player that can ride momentum for awhile. I would not be surprised to see him win this week or finish in the final four. Good read. I like Rose and enjoy seeing him play well.